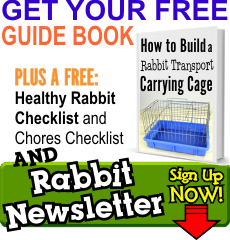 How much should my rabbit eat? Rabbits (just like us people) can start to put on weight if they are fed too much, which can lead to all sorts of health problems. Luckily, we can fix that by making sure that our bunnies are receiving just the right amount of high quality pellets and treats to keep them healthy so they can live a good, long life! Here are some good general guidelines for food amounts but keep in mind that every rabbit is different (different energy levels and metabolism) so adjust as needed. Small Breeds (2-4 pounds): 3-4 oz. of pellet feed once per day. Medium Breeds (5-7 pounds) 4-5 oz. of pellet feed once per day. Large Breeds (8-12 pounds) 6-8 oz. of pellet feed per day. 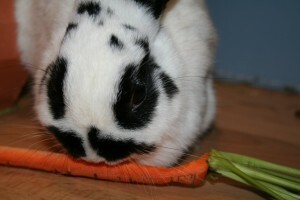 All rabbits should also have a supply of fresh greens and hay to maintain a blanced and healthy diet. If you notice that your rabbit is looking a little thin (you can really see their ribs) then up the amount of food you’re giving them. If you start to see rings of fat forming around their back legs then cut back their food a little and limit treats. 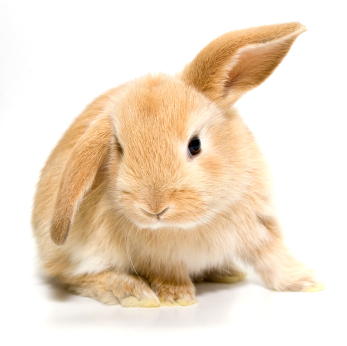 Remember that a little change goes a long way with your rabbit so make adjustments slowly. If you decide to change the brand of food that you’re feeding your rabbit be sure to check out our article on how to change your rabbit’s food safely before you do the switch!